Junior O. Maness, (J.O.) beloved dad, grandpa , great grandpa and a good and faithful servant of his Lord and Savior passed away unexpectedly Monday, December 3rd. 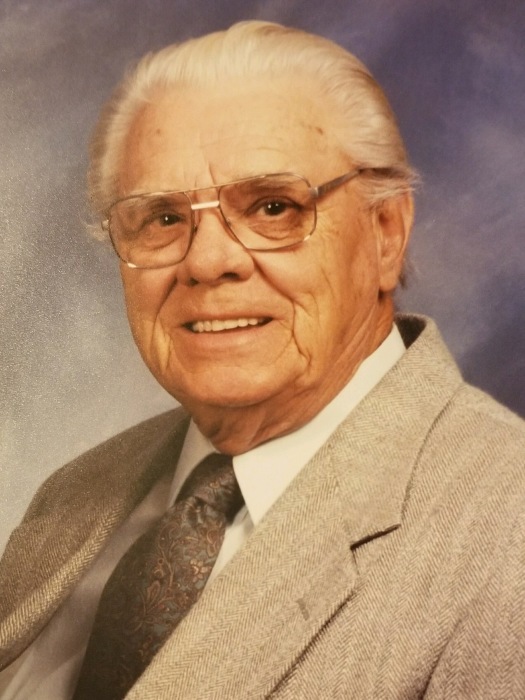 A celebration of his long and fruitful life will be held at 2:00 pm Thursday, December 6th at Northeast Baptist Church with internment to follow at Midway Cemetery. Visitation with the family will begin at 1:00 pm. Junior was born in Guilford County December 10, 1926. He was a charter member of Northeast Baptist Church and sang in their choir until his health began to decline. Junior served in the U. S. Army during WWII in Japan. He proudly worked in Maintenance at Container Corporation for 42 years and could fix just about anything. After retiring, he and Kathleen pursued his life long passion of raising chickens on JoKo Farms in Bear Creek. Daddy dearly loved his family, gospel music, to laugh and always had some funny stories to tell. He was especially fond of his golf cart, Speedo, his dog Smokey and constant companion and great granddaughter, Skylar. He was preceded in death by his wife and true love, Kathleen Oates Maness, the mother of his children, Juanita G. Whitfield and a great granddaughter, August Fleming. His memory will be cherished by his children, Janet Eason (Daniel), Randall Maness (Linda), Robin Fleming (Joseph) and Russell Maness (Linda). Stepsons, Mark Nance (Sierra) and Steve Nance. Grandchildren, Merianne Apple (Vince), Greg Apple, Chad Maness (Lori), Emily Harmon (Luke), Shawn Fleming (Catherine), Philip Fleming, Hannah May (Cody) and Rusty Maness (Tonya), and 16 great grandchildren. In lieu of flowers, contributions may be made to Northeast Baptist Church, 2354 Huffine Mill Rd, McLeansville, NC 27301.